Charmante villa avec grand jardin, grande chambre belle et 5 chambres. Grande villa de charme des années 20 avec vélo la distance de la mer et du centre. La maison dispose d'un grand salon et cinq chambres pour accueillir 6 personnes (lits d'appoint peuvent être déployés à un coût supplémentaire). La maison est lumineuse et fraîche et il ya place à la fois pour la petite et grande famille qui sont en vacances. Au rez de chaussée il ya une cuisine avec des sièges pour 6-8 personnes et aussi une salle à manger pouvant accueillir jusqu'à 8 personnes. La cuisine est entièrement équipée avec plaque à induction, four, micro-ondes, lave-vaisselle, grand réfrigérateur (grand congélateur au sous-sol), grille-pain, cafetière, mélangeur électrique, gaufrier, etc. Pour la maison il ya un grand jardin avec salle de jeux et de détente. Dans le jardin, il ya deux grandes terrasses avec tables et chaises et barbecue sur d'agréables soirées. En vélo, il ya des miles de plages de sable pour la baignade et jeu et RååVallars aussi complexe avec piscines et terrains de jeux. Au sous-sol il ya deux salles de bains. Une salle de bain est avec douche intégrée, WC et deux lavabos. La deuxième salle de bains dispose d'un coin toilette et douche avec portes en verre. Au rez-de-chaussée et l'étage supérieur sont les toilettes avec lavabo. Toutes les salles de bains / toilettes sont en très bon état avec des carreaux de sol et de carreaux. This property is large, clean, and feels like home. It is centrally located and easy to get to the center of Helsingborg, the ferry terminal, the train station and the major highways. Also only a short bike ride to a beach. We had a wonderful time and enjoyed the stay at this property. Wir waren mit zwei Familien (7 Personen) für 9 Nächte in Helsingborg in dem schönen Haus gewesen. Das Haus hat alles wie in der Anzeige beschrieben und sogar noch einiges mehr. Jede Familie hatte seine eigene Etage. Der Wohn- und Essbereich, sowie der großzügige Garten laden zum Verweilen ein. Die zwei sehr modernen Badezimmer, incl Waschküche befinden sich im Keller. Uns hat es sehr gut gefallen und wir können das Haus mit guten Gewissen weiterempfehlen. Disappointing and frustrating - AVOID! This property is not suitable for elderly people, small children, tall people or people with pet allergies. Restricted headroom in many areas, incredibly steep hazardous stairs to top level. Arrived at the house and had to make our own beds up, no information where to find the sheets - found them in the basement. One pillow case short. An information sheet left on the kitchen worktop referred to a booklet containing information about the house and its surroundings but the booklet was nowhere to be found. Eventually found it on top shelf in basement pantry - host told me that they didn't want us to look at it as it was not up to date. Struggled to work out how everything worked - heating, oven etc. Had to contact the host time after time to ask information regarding minor things which would normally have ben provided in an information book (from previous holiday rental experience). All the lighting was very dim and the host told me it was Swedish law to have dim lights, but this is clearly not true. It is an EU directive to switch to energy saving lighting but you can buy bright lights. Final straw was that my daughter developed an allergic reaction because her bed cover was covered in a thick layer of animal hair - cat or dog not sure. Host told us that it was probably an earlier guest who had brought a dog and "it says in the advert that you can bring pets", but I question how she could blame the dirty conditions on a previous guest at the same time as charging us a hefty cleaning fee! Host told me she declined any further complaints and that the nearby store had allergy remedies if we needed it. The bed spread was disgusting!!! The bedlinen and towels did not smell fresh, they were musty. Quite possibly the worst holiday home we have rented and we have rented many. I wish I could get a refund but I guess that will be impossible, this property was not as described. The area looks suburban but it is quite a rough area within a stone's throw from the Bandidos HQ, one of the four local motorcycle gangs, who are not very nice people as we understand it. So glad to get home again. I am sad to hear that you are so disappointed at the house. We had a nice afternoon with your parents before Christmas where we sat down and informed them about the house. We agreed that there were no need for any information on paper, thats why we did´t leave any for you. You contacted me about the lights that you though were to dim and I told you that it will be brighter. We can´t buy normal light bulbs any more because they only sell LED or energy saving lights in the store. You also complained about the uneven heating in the house and that the ceiling were to low at some spaces. Yes, I agree on the fact that we have some spaces with a low ceiling for instance the stairs to the basement. But if you have a normal height there will be no problems using the stairs. I agree that the cleaning was imperfect and I have already apologized for that. You had a discount on the rent from the beginning that you forgot to mention in your review. I am so sad about your daughters allergic reaction. But as I already told you and as it says at HA, pets are welcome and there are animals living in the house all year around. The neighborhood is one of the safest in Helsingborg accordion to the police even though it looks a lithe rough at wintertime. But doesn't every place without snow looks like that? And yes we have Bandidos just around the corner but a more quiet and safe neighborhood you have to look for. In this house you have to make your own beds when you arrive if you have not asked for anything else. In that way we can guarantee you that you have a clean bed ( the towels and sheets were clean). I kindly offered to come and make the beds for you and help you with your problems but you declined. We did our best to help you with your issues but for every right we did you found two more wrong. Yes, I kindly asked you not to send any more text messages to me. But that was after that you became rude and unpleasant. I believe that there is always a way to solve problems if you are able to listen to each other. Next time I recommend you to find a nice hotel. I also recommend you to treat owners and staff with kindness and respect and have in mind that we all are doing our best to help our guests. I am glad you had a safe trip back home. Sehr schönes gut ausgestattestes Haus in einer ruhigen erholsamen Lage !!! Wir haben unseren Aufenthalt in diesem Haus sehr genossen und können dieses Domizil bestens weiterempfehlen. We had a great time in Sweden and enjoyed very much this house. It offers everything that is needed for a pleasant stay. Everything went perfect and absolutely easy to rent this house. Het huis is bijzonder mooi, ruim en prima onderhouden. Het contact met de eigenaar verliep bijzonder vlot. De eigenaar stelde zich trouwens heel correct en soepel op en zorgde voor een warm onthaal. Het huis is redelijk goed gelegen, zeker als je de kant van Raa op gaat. Dat is immers een heel mooi dorp, met een mooie haven en wegen om heerlijk te fietsen. De stad Helsingborg ligt vlakbij, jammer dat er nogal wat industrie aanwezig is aan die zeekant. Wij hebben een heel toffe week gehad en kunnen dit verblijf dan ook warm aanbevelen. Dans «perle du détroit", vous pouvez profiter de la mer et de la nature alors que vous avez toutes les activités de la ville à portée de main. Avec le ferry pour le Danemark, vous arriverez Elsinore avec ses ruelles pittoresques en seulement 20 minutes et à la ville de Copenhague peut être atteint en voiture sur le pont de l'Öresund en une heure. 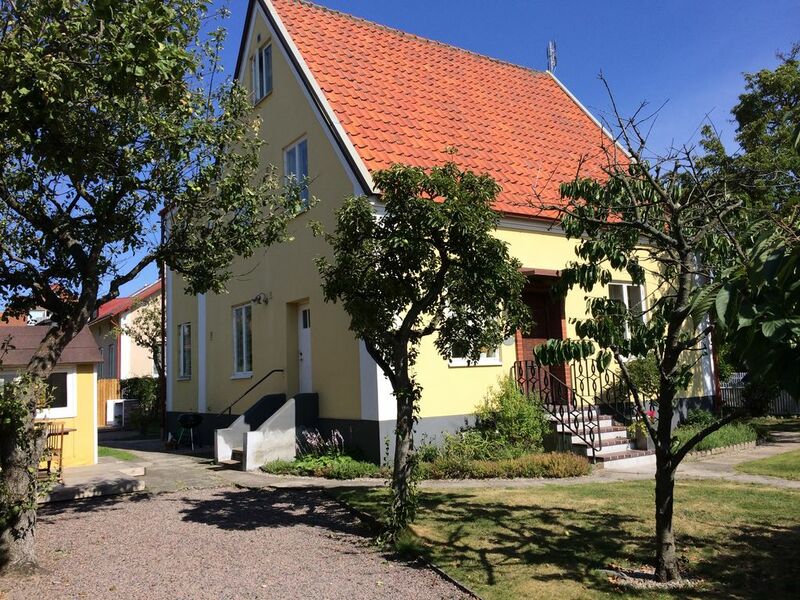 La maison est situé à 2 km au sud du centre-ville Helsingborg dans un quartier qui est calme et paisible. De là, il est à 2 km de la plage la plus proche et à 3 km de l'emplacement de pêche pittoresque Råå où il ya de larges plages, mini-golf et restaurants. Si vous voulez aller visiter la très belle île de Ven dans le milieu du détroit, les bateaux pendant l'été de port brut. Au nord de Helsingborg est Sofiero. Château Sofiero était l'été aimée du roi Gustav VI Adolf maison et ce est encore en croissance de sa collection de rhododendrons célèbre qui est une attraction touristique majeure au printemps. L'endroit vaut bien une visite car il est un des plus beaux jardins du château d'Europe. Au nord de Helsingborg est également Palsjo forêt avec des sections de marche et de la distance à vélo. En moins de 20 minutes, vous atteindrez la crête sud avec ses paysages incroyables. De Astorp au pied Söderåsens à Agusa sur Österlen vous pouvez marcher sur Skåneleden Etage 3ème Ici vous passez puissants gorges, magnifique parc national et des promenades mouvementées. Priset per period gäller för 7 personer. Vid extrasängar tillkommer en kostnad med €120 per person och vecka. Slutstädning ingår ej men kan bokas för en kostnad av 175 € Betalning går att göras med Paypal, swish eller överföring till bankkonto.